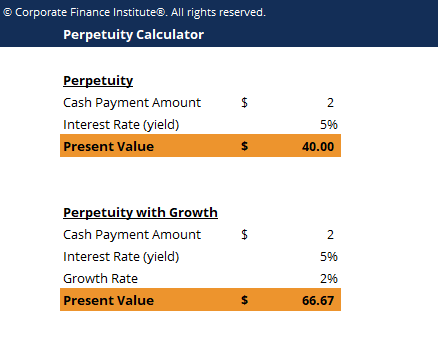 This perpetuity calculator shows you how to compute present value of perpetuity and perpetuity with growth. A perpetuity in the financial system is a situation where a stream of cash flowCash FlowCash Flow (CF) is the increase or decrease in the amount of money a business, institution, or individual has. In finance, the term is used to describe the amount of cash (currency) that is generated or consumed in a given time period. There are many types of CF payments continues indefinitely or is an annuity which has no end. In valuation analysisValuation MethodsWhen valuing a company as a going concern there are three main valuation methods used: DCF analysis, comparable companies, and precedent transactions. These methods of valuation are used in investment banking, equity research, private equity, corporate development, mergers & acquisitions, leveraged buyouts and finance, perpetuities are used to find the present value of a company’s future projected cash flow stream and company’s terminal valueTerminal Value​The terminal value is used in valuing a company. The terminal value exists beyond the forecast period and assumes a going concern for the company.. Essentially, a perpetuity is a series of cash flows that keep paying out forever. Although the total value of a perpetuity is infinite, it has a limited present valueNet Present Value (NPV)Net Present Value (NPV) is the value of all future cash flows (positive and negative) over the entire life of an investment discounted to the present. NPV analysis is a form of intrinsic valuation and is used extensively across finance and accounting for determining the value of a business, investment security,. The present value of an infinite stream of cash flow is calculated by adding up the discounted values of each annuity and the decrease of the discounted annuity value in each period until it reaches close to zero. The finite present value of a perpetuity is used by an analyst to determine the exact value of the company if it continues to perform at the same rate.